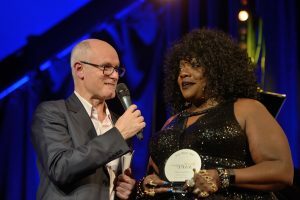 Crowned “Detroit’s Queen of the Blues” in 2015, Thornetta Davis a multi-talented International Singer and Songwriter from Detroit MI, USA is the Winner of over 30 Detroit Music Awards, including sweeping the 2017 and 2018 DMA’S. Thornetta has been exciting and wowing audiences all over the world. Her voice is strong, commanding, melodic and smooth. She tells her stories with incredible delivery and leaves her audiences wanting more. 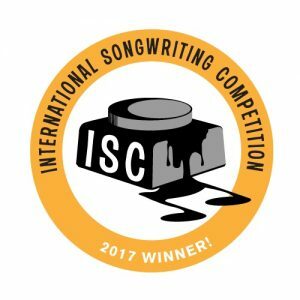 Backed by her great band of Detroit Musicians. She first gained attention in 1987 when she became back up singer for the Detroit soul band “Lamont Zodiac and The Love Signs”. Shortly after, the lead singer left the band and the name changed to “The Chisel Brothers featuring Thornetta Davis”. In 1996 Thornetta recorded her first solo album “Sunday Morning Music” on the Seattle based label “Sub Pop” which received a rave revue in the national Entertainment Weekly magazine. Her song “Cry” from that album was featured on the HBO hit “The Sopranos”. Thornetta has opened for legendary blues and R&B greats such as Ray Charles, Gladys Knight, Smokey Robinson, Etta James, Buddy Guy, Koko Taylor, Junior Wells, Lonnie Brooks, Johnnie Johnson and many more…her history is extensive and her performances are memorable…like the time she opened for Bonnie Raitt at Michigan’s Ann Arbor Blues & Jazz festival in 1992. Bonnie asked Thornetta to join her and Katie Webster (queen of the swamp boogie) for an encore song which received a standing ovation. In 1999 Thornetta brought down the house with her astounding performance at the “Lillith Fair” at Michigan’s Pine Knob Music Theatre hosted by Sarah Mclachlan…that same evening she attended the “Detroit Music Awards” where she proudly accepted 2 of the over 30 Music Awards that she has won over the last 20 years for “Best R&B/ Blues vocalist” and “Best R&B Group”. In 2000 Thornetta opened the VH1 Vogue fashion awards at Madison Square Garden with Detroit phenomenon Kid Rock. New York’s star-studded event captured Detroit’s “Princess of the Blues” in all her glory! magic comes through and touches you and makes you feel like you’re right there watching her as she takes you on a spiritual journey to the depths of her soul. 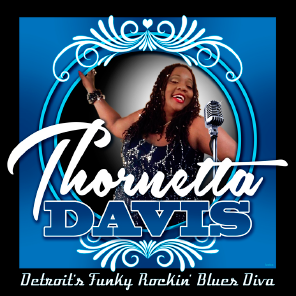 “Thornetta Davis covered Live at the Music Menu” won “Best R&B/ Blues Recording” at the Detroit Music Awards 2002. In 2006 Detroit’s “Princess of the Blues” appeared again with Kid Rock during the Super Bowl week on “Jimmie Kimmel Live”. In 2007 Thornetta performed with Bob Seger and the Silver Bullet Band and took a bit out of the “Big Apple” on “The View” and “The David Letterman Show”. Thornetta has electrified audiences world wide with tours to Italy, Blues festivals in Tunisia North Africa, Lucerne Switzerland, Sweden, Paris France, Norway, Germany, Holland, England and Canada . 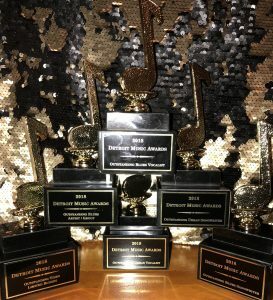 Here’s a few of Thornetta’s accomplishments. 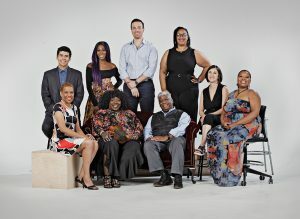 2014- THORNETTA WAS FEATURED AS SPECIAL GUEST IN A PBS “AMERICAN MUSIC RESEARCH FOUNDATION” DOCUMENTARY ABOUT BLUES MUSIC HISTORIAN COREY HARRIS. July 2014 -Thornetta Produced and Performed Her show AT ORCHESTRA HALL for the Concert of Colors w/ The Detroit Symphony Orchestra conducted by Grammy Award winning John McLaughlin Williams. 2013 – PERFORMED IN THE PLOWSHARES PRODUCTION “THE DIVA PROJECT” WHICH PAID TRIBUTE TO LEGENDARY WOMEN SINGERS, PAST AND PRESENT. 2006 – PERFORMED IN THE LUCERN SWITZERLAND BLUES FEST AS APART OF THE DETROIT BLUES LEGENDS LINEUP. 2006- Appeared with Kid Rock during the Super Bowl week on “Jimmie Kimmel Live”. 2001- Thornetta’s powerful singing voice has been heard on the hit television show “Xena Warrior Princess”. 2001 – Thornetta performed on the soundtrack for the film “Osmosis Jones” SONG PRODUCED BY KID ROCK FILM starring Bill Murray.